iBall has announced its upcoming android based smartphone that can works as a projector as well , the Andi 4A Projector . Well it will be very interesting to see the output from the device . It has 1GHZ Dual Core Cortex A9 processor paired with 512MB of RAM . It packs with 8MP AF rear camera with LED flash and a front facing camera . 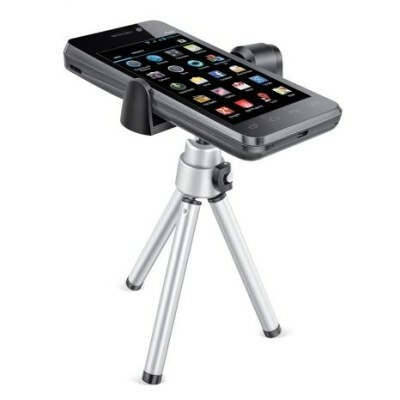 iBall Andi4A projector comes with a Free tripod to make the device stable while using projector . It has 35 lumens projector that allows user to project digital media up to 10feet in VGA resolution . It comes with4″ inch IPS WVGA resolution display that offers 233PPI . It packs with 1500mAh battery . 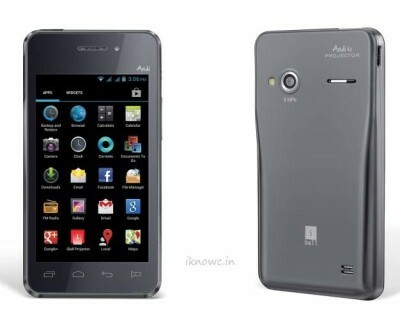 The Andi 4A has 4GB of ROM and Expandable memory up to 32GB via micro SD card . Talking about the OS , its runs on Android 4.1 Jelly bean OS . It also features 3G , 2G , WIFI , Bluetooth , GPS / A-GPS , EDGE , 3.5mm audio jack . The iBall projector andi 4a has Gravity sensor , light and proximity sensor . 1GHZ dual core processor , 512MB RAM . 3G , 2G , WIFI , Bluetooth , GPS / A-GPS , EDGE , 3.5mm audio jack. Sensors : Gravity , light , proximity . 4GB ROM , 32GB expandable memory . 35LM projector with VGA projection . Dual SIM , with dual standby . 8MP Auto focus rear with led flash and front facing camera . The iBall Andi 4A Projector will be priced at RS 18,999 .